Plaids, checks and stripes combine to make this scrappy quilt for a country accent as a den throw or in a masculine bedroom. 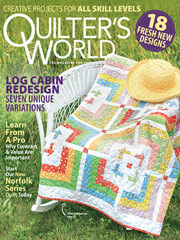 This e-pattern was originally published in 101 Made-to-Fit Quilts for Your Home. Size: Twin: 63" x 79". Double: 78" x 87". Queen: 89" x 91".